For the World Land Trust (WLT) to be able to funds the purchase and protection of rainforests and other threatened habitats, we rely on the generosity of our supporters. Buying an acre as a Christmas gift is a great way to help protect wildlife habitats on behalf of a friend or relative. 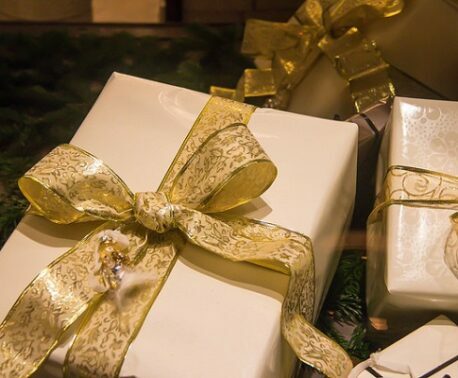 But there are times when this gift isn't appropriate and you would like to give a more personal present. Worry not as you can still support the World Land Trust and save rainforests in other ways. Here are three gift suggestions that will make wonderful gift alternatives and that help support the World Land Trust's work. See larger image of bracelet. The Fashion for Forests jewellery collection from Dower & Hall takes its inspiration from the tropical forests and features animal charms such as hummingbirds and frogs. A donation for every item sold is made to WLT to supports rainforest conservation projects*. 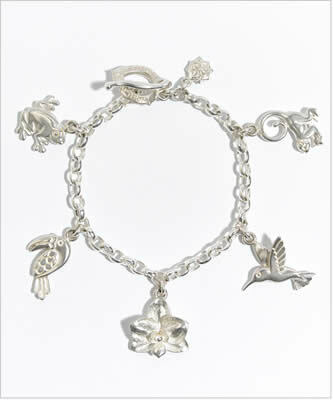 The collection includes this pretty, and fashionable, forest charm bracelet (pictured) and four gorgeous animal pendants in silver with semi-precious beads. To view and purchase items from this collection, choose "Fashion for Forests" from the Collections list on the Dower & Hall website. *Half an acre of rainforest is saved for every Fashion for Forests Forest Charm bracelet or pendant purchased. More details about Organic Meltdown. Where to buy Organic Meltdown. Definitely approved by the WLT staff, Organic Meltdown isn't just organic and fairtrade, but each bar sold helps protect forests in the WLT project areas*. Made with Swiss chocolate, Organic Meltdown is available in five mouth-watering flavours, including milk chocolate, dark chocolate with Indian spice and dark chocolate with cinnamon & chili. Their claim that One Bar saves One Tree really is the case so please buy and eat lots of bars! Organic Meltdown can be purchased at Waitrose stores in the UK. Learn more about the chocolate and the flavours available on the Organic Meltdown website. *Approximately one tree saved per bar of Organic Meltdown Chocolate purchased. Learn more about SkitoStop on the Nikwax website, including details on where to purchase SkitoStop products. *2% of the SkitoStop revenue is donated to the World Land Trust.